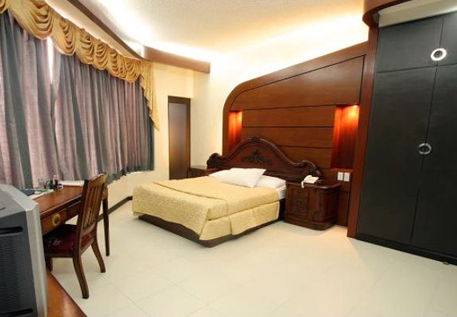 Sunflower Hotel is a welcome addition to the ever growing number of hotels in Davao City that provide clean, comfortable, and safe accommodations to the likewise ever growing influx of foreign and domestic tourists who visit the city either on business or simply for leisure travel. And whatever the reasons, visitors will surely find a safe haven of comfort and style within Davao City. 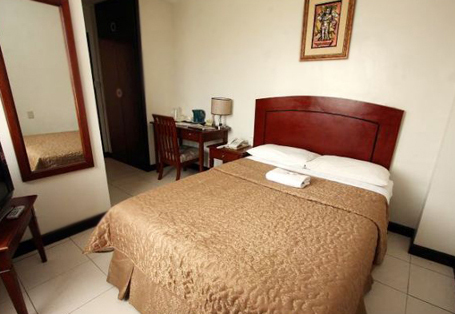 Opened for business in July 30, 2011, this three-star, three-storey Hotel has all the conveniences and comforts of home at a price competitive with traveler's inns. It is located right in the very heart of downtown Davao City, and is conveniently close to several business establishments, entertainment areas, restaurants, coffee shops, and shopping malls, with easy access to all kinds of public transportation. The Hotel has a 24-Hour Front Desk and personalized room service, massage services, laundry and dry cleaning, ironing services, a cocktail bar and buffet restaurant that serves locally prepared cuisines, sports and recreation facilities, multi-purpose function hall, fresh issues of newspapers, FREE Wi-Fi Internet access and a secure car park. There are 38 comfortable rooms that are exquisitely designed to provide guests with maximum comfort during their stay in the hotel. 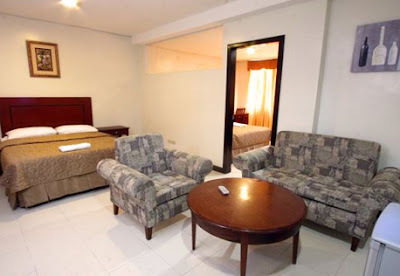 Standard Single is air-conditioned, beautifully furnished with a single bed, a large wardrobe closet, writing desk, flat screen LCD cable TV, telephone system, FREE Wi-Fi Internet access, and a private bath tub and toilet with hot and cold showers. Standard Double is air-conditioned, beautifully furnished with two single beds, a large wardrobe closet, writing desk, flat screen LCD cable TV, telephone system, FREE Wi-Fi Internet access, and a private bath tub and toilet with hot and cold showers. Deluxe Single is air-conditioned, beautifully furnished with a single double bed, a large wardrobe closet, writing desk, flat screen LCD cable TV, telephone system, FREE Wi-Fi Internet access, and a private bath tub and toilet with hot and cold showers. 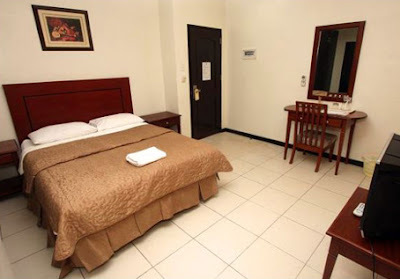 Deluxe Double is air-conditioned, beautifully furnished with two double beds, a large wardrobe closet, writing desk, flat screen LCD cable TV, telephone system, FREE Wi-Fi Internet access, and a private bath tub and toilet with hot and cold showers. Super Deluxe Single is air-conditioned, beautifully furnished with a single double bed, a large wardrobe closet, writing desk, flat screen LCD cable TV, telephone system, FREE Wi-Fi Internet access, and a private bath tub and toilet with hot and cold showers. 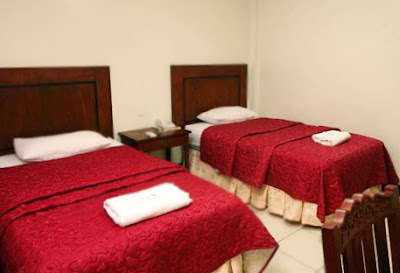 Super Deluxe Double is air-conditioned, beautifully furnished with two double beds, a large wardrobe closet, writing desk, flat screen LCD cable TV, telephone system, FREE Wi-Fi Internet access, and a private bath tub and toilet with hot and cold showers. 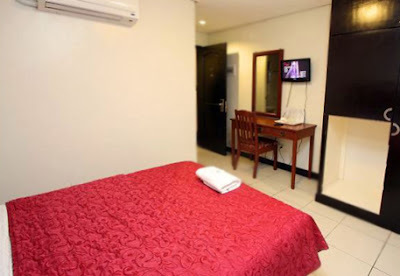 Executive Suite Single is air-conditioned, beautifully furnished with a single double bed, a large wardrobe closet, writing desk, sofa, flat screen LCD cable TV, telephone system, FREE Wi-Fi Internet access, and a private bath tub and toilet with hot and cold showers. Executive Suite Double is air-conditioned, beautifully furnished with a single double bed, a large wardrobe closet, writing desk, sofa, flat screen LCD cable TV, telephone system, FREE Wi-Fi Internet access, and a private bath tub and toilet with hot and cold showers. 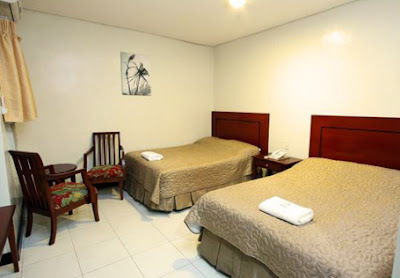 Family Room is air-conditioned, beautifully furnished with a single double bed, a large wardrobe closet, writing desk, sofa, flat screen LCD cable TV, telephone system, FREE Wi-Fi Internet access, and a private bath tub and toilet with hot and cold showers. Presidential Suite is air-conditioned, beautifully furnished with a single double bed, a large wardrobe closet, writing desk, sofa, flat screen LCD cable TV, telephone system, FREE Wi-Fi Internet access, and a private bath tub and toilet with hot and cold showers. All accommodations come with a complimentary breakfast. Check-in time is 2PM and Check-out time is 12PM. All major credit cards are accepted subject to the Hotel's right to pre-authorize prior to arrival. 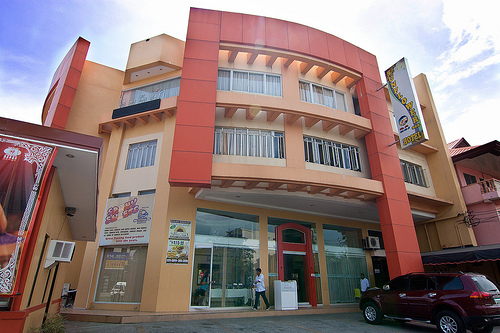 The Hotel is situated along the corners of Tionko Avenue and Araullo Street in downtown Davao City and is close to the Davao City National Highschool, Department of Education Region XI, Central Bank, Bureau of Internal Revenue, Assumption Church, and about 20 minutes drive from the Davao International Airport. 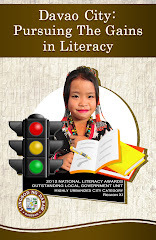 It is easily accessible to all kinds of public transportation. 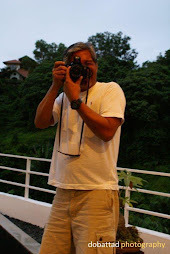 I was in Davao back in September and April 2011. I stayed at the "My Motel." I think this hotel is a bit nicer.I may stay here on my next visit. Thanks for the information, good post.